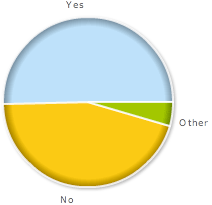 In May I ran an informal poll asking Would You Buy a Link With a NoFollow Attribute? In short, a nofollow attribute is an HTML attribute you add to a hyperlink that tells the search engines that you do not vouch for this link. Most search engines will not count that link as a vote for the site it is linking to. I was actually surprised by the results. They were split down the middle. Of the 177 responses, 50% or 89 people said they would buy a link with a nofollow attribute. While 45% or 80 people said they would not. 5% or 8 people said, it depends. Forum discussion continued at DigitalPoint Forums . Previous story: Is Yahoo Search More Relevant Now? SEOs Claim "More Like Google"